At Life's Last Threshold, Choir Brings Comfort At a hospice in Nashville, volunteers sing hymns and lullabies to the dying. They're part of a national organization that uses music to soothe life's final passage. 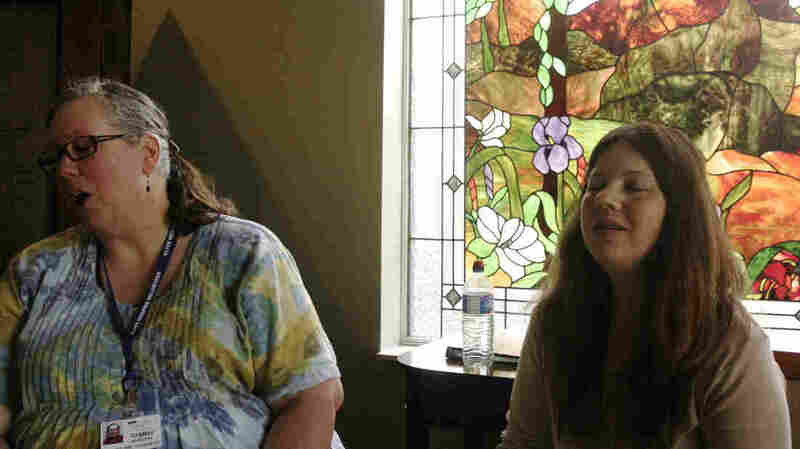 Tammy Heinsohn (left) and Carolyn Wilson sing in the meditation room of Alive Hospice in Nashville. They're part of the Threshold Choir, which sings to the dying. The Threshold Choir brings music to those on the threshold of life — people who are dying. The first group started about a decade and a half ago. Now there are choirs in 120 cities, and even a few countries. One of the newer chapters is in Nashville. On a recent day, Tammy Heinsohn and two other choir members were going room to room at a hospice there, introducing themselves and offering to sing some lullabies. Hear an interview with the founder of Threshold Choir. They waited at one doorway until 86-year-old Avis Moni told them to come in, then walked to her bedside and began singing. Moni had terminal colon cancer. She had been in hospice for about a week. The choir members sang "Amazing Grace," which Moni said was one of her favorites. As the hymn began, Moni tried to sing along. Heinsohn, a 53-year-old event planner, started the Nashville Threshold Choir last year. She wanted to help hospice patients relax in the final moments of their lives, just as she did with her own mother, who died of kidney cancer 20 years ago. "I ended up singing to her at the bedside as she was dying," Heinsohn said. "And then when I heard about Threshold Choir, that's when I got the chill up my spine, and I knew that, yes, singing was a critical component of the dying process for some people." Laura Beth Jewell is a music therapist at Alive Hospice in Nashville, where the Threshold Choir sings every week. "Music has the power to reach people on a deeper level than any type of verbalization or even sometimes touch can," she said. Jewell also said music can bring back memories, just like a smell can. "Whether the patient has dementia and can't remember his or her own name or their daughter's name, they may remember the song their mother used to sing to them as a child," Jewell said. "Taking memories from your past life and being able to experience them as you're dying is a wonderful thing." Carolyn Wilson, another member of the choir, is 43 and works in a daycare. She had already been singing to hospice patients on her own for several years before she discovered the Threshold Choir. "I started coming in and just bringing my piano keyboard that I had," she said. "I'd pop it on one of their carts and just drag it around to the different rooms and plug it in and say, 'Do you want music? Do you want to hear any songs? ' "
She describes singing to people at the end of their lives as standing on holy ground. "As I was growing up, I went through foster care, through adoption, different just ups and downs in life, and music was just always such a healing for me," she said, "and just has a way of breaking through whatever's going on, whatever the struggle is — the end of life or any other time of life, too." Wilson said it's more fulfilling to sing with a group. But the work can also be emotionally challenging, and some singers who try out the choir have left. "You kind of have to sort of step out of yourself a little bit," Wilson said. "Because as a human, as a person, you see what these people are going through, and you definitely feel that." When the choir visited Avis Moni earlier this year at Alive Hospice, she had about a month left to live. She died in July. We're recognizing, just like birth is so magical and wonderful, that death is also magical and wonderful in its own way. The Nashville group now has three or four regular members; some of the larger chapters have 20 or 30. When the choir was first founded, only women were allowed. The idea was that women had a special role at death, just as they do at birth. The choir is still mostly women, according to Francesca Wright, who is on the national board of the Threshold Choir. The number of choirs is growing, Wright said, because there is a shift in the way people view death. "We are not turning away from things that may have been scary or we may have been protected from," Wright said. "And we're recognizing, just like birth is so magical and wonderful, that death is also magical and wonderful in its own way, and I think we're reclaiming our humanity."